In the one (of four) corners, you have Porsche with a massively revised 919 Hybrid. They make the step up into the 8 MJ Power category. This car represents an evolution of the 2014 919. Through the use of new technology and batteries (provided by A123) Porsche have managed to step up to the 8 MJ category AND are at the minimum weight limit. They have solved their problems from last season and have conducted about 26,635 Km in testing this year alone. The 2015 919 generates (according to press) 500 hp through its 2L v4 engine which powers the rear wheels. An electric motor powers the front wheels from a set of liquid cooled A123 lithium-ion batteries. Energy is collected kinetically through the front wheels and from heat (waste) thermodynamic energy from the exhaust. 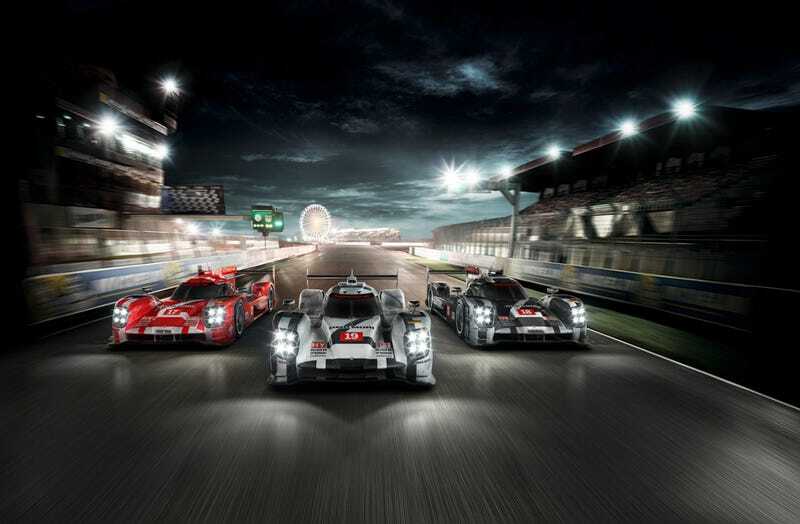 As with the Audi R18 and the Toyota TS040, the Porsche 919 is also a momentary AWD hybrid. Last year, Porsche took their first win at Sao Paulo and definitely had the speed. They took pole at Spa, Shanghai, Bahrain, and Sao Paulo thanks to the battery's ability to store up energy and cart it around the track. With the improvements they've made this year, Porsche is sure to be a contender. Porsche have taken #17 - #19 for this year's WEC. The #17 and #18 are the full season entries and the #19 car will be the Spa & Le Mans only entry. If you're looking at the picture above, you'll see three different color schemes.. this'll only be for Le Mans. The #17 is the red car, the #18 is the black car and the #19 is the white car. #18 is the link between the 919 Hybrid and the 918 Spyder. #17 will be the drivers of last year's #20 car. Mark Webber, Timo Bernhard, and Brendon Hartley. #18 will be driven by last year's #14 car. Neel Jani, Roman Dumas and Marc Lieb. #19 will be driven by Nico Hulkenberg, Nick Tandy and Earl Bamber. This car continues to run in the 6 MJ hybrid category and closely resembles the 2014 car. However, if press is to be believed, the TS040 is a completely new evolution; 80% of its parts have been redeisgned... including a new Front End, a new Crash Structure, a new Suspension system, and most importantly, the hybrid system has been enhanced. Last year, the hybrid system was not able to collect maximum energy all the time, but this year it will. As it continues in the 6 MJ category, the car will continue to produce over 1,000 PS of power from the combined supercapacitor and 3.7L v8 internal combustion engine. Power will be collected kinetically via the front and rear wheels giving the car momentary four wheel drive. The team has completed over 26,500 km of testing and first started testing on Jan 13th at Circuit Paul Ricard. As reigning world champions with the most mature technology, they seem to be pretty confident. Supposedly this new model has gained over 2-3 seconds of pace, though Toyota hasn't defined the track where the 2-3 seconds were gained. Driving the #1 car will be defending World Champions Anthony Davidson and Sebastien Buemi. They will be joined by Kazuki Nakajima who will be racing a full FIA WEC season for the first time and comes from the sister car. In the #2 car will be Alex Wurz, Stephane Sarrazin, and former test driver Mike Conway. TMG has retained Kamui Kobayshi as the Toyota Racing test/reserve driver with Nicolas Lapierre serving as a further reserve driver for testing and development duties. Additionally, the 2015 TS040 uses RAYs wheels. As a nice little note, with Porsche stepping up to 8 MJ, Audi stepping up to 4 MJ, and Nissan supposedly homologating the GT-R LM NISMO in the 2 MJ category.. we'll have a contestant in every MJ power category.